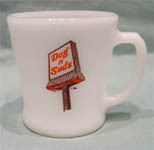 Above is one of the first Dog 'n Suds signs ever made. It was originally licensed in Dunkirk, IN. 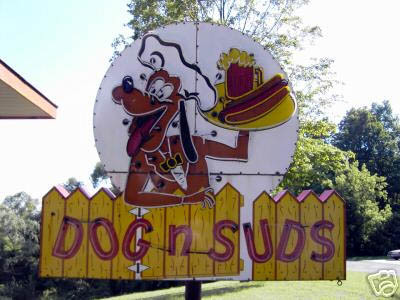 The sign was an art class project which the founders of Dog 'n Suds conducted. Unfortunately, the Disney Co., as the story goes, took offense in that the Rover Image on the sign too closely resembled their Pluto character. The sign was redesigned as shown here on the left, with a different look to Rover and a red background. Dining out on a budget in the 50's and 60's involved jumping in the car and heading to the drive-in. We had lots of choices back then for food delivered to the car via roller-skate-wearing-carhops. For example, there was A&W, Sonic, Big Boys and so on. People had cars. People got hungry. People couldn't afford to spend much. That all added up to the need for drive-ins. And they could be found everywhere. A small town with a population of 5,000 or so might have three or four drive-ins doing a brisk business. Reading all of that writing on the wall, two music teachers from the University of Illinois, Don Hamacher and Jim Griggs, decided in 1953 to get in on the fun. 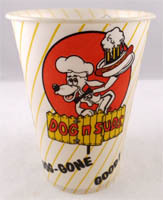 They opened a drive-in in Champaign and called it Dog n Suds. It was a hit, so much so that they were approached by a sweet old lady with a bank account full of cash to build her one just like it. Hamacher and Griggs soon had a tiger by the tail. The time was perfect for franchised drive-ins, and Dog n Suds had a lot to offer potential entrepreneurs. They quit teaching and became restaurant magnates in short order. 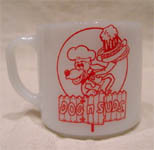 Dog n Suds began springing up all over Illinois, as well as nearby Indiana, Michigan, and Ohio. A rave review of their business plan in a trade magazine added to the furor, and by the 1960's they had reached the southern United States. They were averaging fifteen new restaurants per month during the height of their success. By 1970, it seemed that every town big enough to have more than one stoplight also had a Dog n Suds. But unfortunately, a lot of sweet memories bit the dust in the 70's. The economy took some seriously bad turns, and then there were those blasted Arabs and their oil embargo. The times were changing fast. We didn't go to as many drive-ins as we used to. The glory days for Dog n Suds were over. Instead of fifteen new restaurants opening each month, now they were closing. 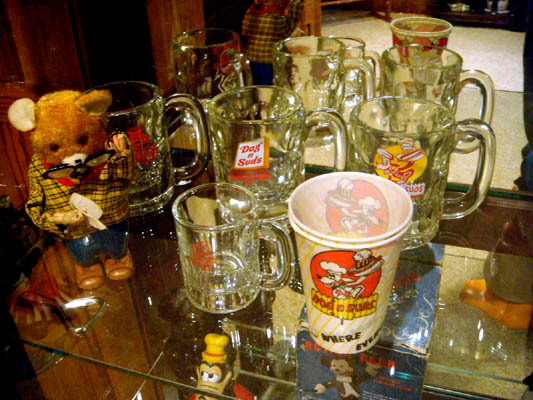 The founders sold out, and it appeared that Dog n Suds might well go the way of so many other beloved memories that we grew up with. But a funny thing happened. Some Dog n Suds' survived. The brand name had a fierce loyalty among its customers, and many restaurants weathered the storm. 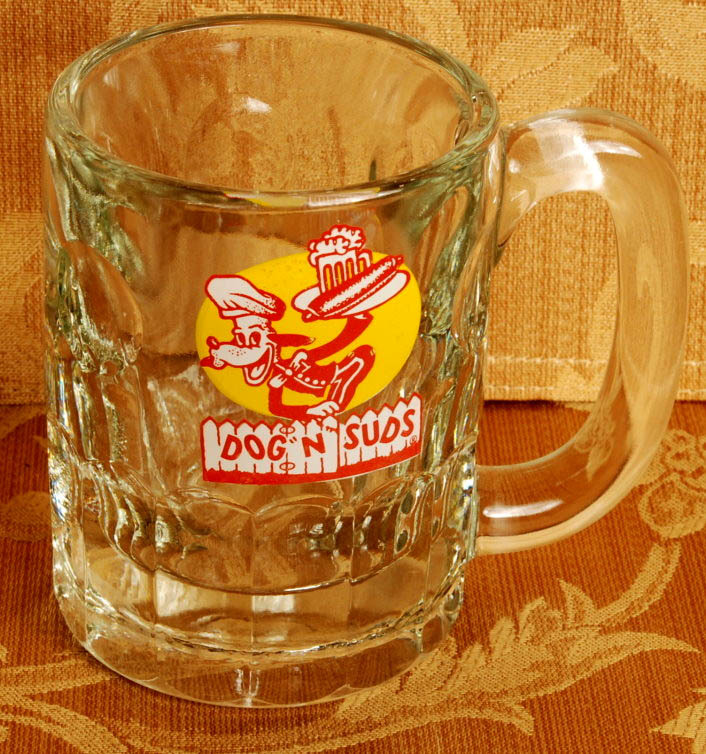 It was a curious case of the Dog n Suds name almost outlasting the Dog n Suds franchise. Nowadays, Dog n Suds are down to, ironically, fifteen in number. But a new one was opened in 2007, in Norton Shores, Michigan. Many of the survivors have cashed in on the retro craze, with redesigns that provide old fashioned soda fountains. Who knows, the franchise may end up reinventing itself and thriving once again, like A&W did. 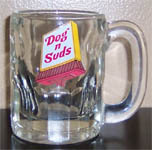 However, some Dog n Suds' exist exactly as they did when their customers drove up in tank-sized cars, ordered a dog and suds for less than a dollar, and winked at the cute roller-skate-riding carhop as she placed the tray loaded with goodies on the rolled-down window.